There was a time when customer service simply meant training call center reps to answer the phones. Ah, the good old days. But in today’s hyper-connected digital world, customers expect a whole different level of service. According to Forrester, a whopping 73% of people say that valuing their time is the most important thing a company can do to provide good service (now that’s worth tweeting!). 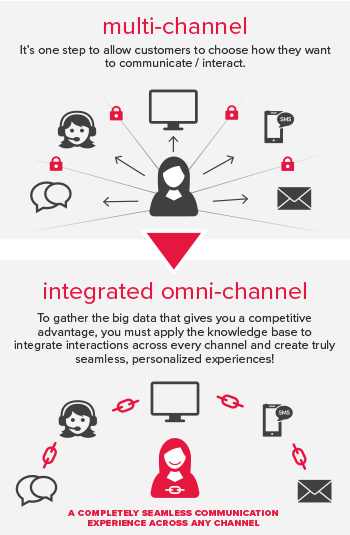 Customers want to find answers quickly and painlessly, on any communication channel they choose, anytime they want, at any point in their service journey — and have the freedom to move between channels without the need to repeat information. Quite simply, when customers are forced to reach out for service, their only goal is to expend as little effort as humanly possible. As customer expectations have become more diverse and demanding, companies have scrambled to give customers new ways to connect — email, online chat, text messaging, social media, mobile apps — while at the same time improving self-service tools like online knowledge bases and automated IVR phone systems. The problem is, these channels typically exist in their own separate silos, so information collected during a chat, for example, doesn’t travel with the customer if they need to get on the phone with a live agent. This forces the customer to repeat information and/or re-authenticate their account, resulting in frustration and disloyalty on the customer side and inefficiency and higher costs for the company. 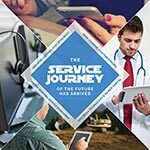 Click here to download a PDF we created called “The Service Journey of the Future” that talks about the 4 things your customers want more of, the only 2 ways to scale customer service, the formula for a thriving contact center, and more. At the end of the day, the experience the customer has during their entire “service journey” is what matters most. According to research from McKinsey & Company, “Satisfaction on customer journeys is 30 percent more predictive of overall customer satisfaction than measuring happiness for each individual interaction.” It’s this critical perception that drives a customer’s level of brand loyalty and directly impacts future buying decisions. Consider the upside… McKinsey’s research estimates that “maximizing satisfaction with customer journeys has the potential not only to increase customer satisfaction by 20% but also to lift revenue by up to 15% while lowering the cost of serving customers by as much as 20%.” Now that’s incentive! Gartner estimates that by the end of this year, 89% of businesses will compete mainly on customer experience. And, by 2017, 50% of consumer product investments will be redirected to customer experience innovations. Without a doubt, customer service trends are changing rapidly, and companies of all shapes and sizes are investing in self-service solutions that allow them to deliver scalable customer care and improve cost to serve — all while enhancing customer experience rather than sacrificing it. Is it time to revamp the way you’re connecting with your customers? Let’s chat. Rick serves as Senior Director, Virtual Assistant Strategy at True Image Interactive, where he helps contact center clients leverage intelligent virtual assistants to improve customer engagement and provide a consistent brand experience. Rick has 25 years of experience in consultative sales and business development, with the last 17 years dedicated to the telecommunications and contact center technology industry.